Germany has called the attack “revolting”. SPANISH AND WORLD leaders have condemned the Barcelona terror attack, expressing outrage and solidarity with the victims. 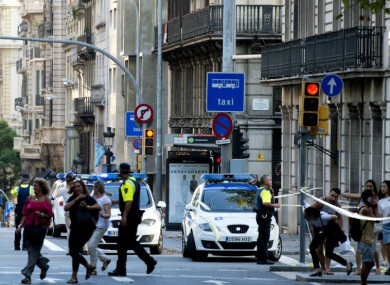 At around 4pm yesterday, a white van drove onto the popular Las Ramblas promenade and drove into crowds of pedestrians – killing 13 people and injuring more than 100 others. FC Barcelona said it is “deeply saddened” by the tragedy and the team’s striker Lionel Messi said separately that people must reject “any act of violence”. “There are many more of us who want to live in a world in peace, without hate and where respect and tolerance are the basis of coexistence,” he added. Taoiseach Leo Varadkar is among the Irish politicians to express his condolences. “On behalf of the government and the Irish people, I would like to extend my deepest sympathy to Prime Minister Rajoy and the people of Barcelona and Spain following this callous act. “An attack of this nature, targeting the people of Barcelona and visitors enjoying that wonderful city in the height of the tourist season, is both wanton and cowardly and has no place in our society. “At this time of immense grief, I want to offer our solidarity and support to the people of Spain, with whom we have such close relations,” Varadkar said. He was referring to General John ‘Black Jack’ Pershing who was the US governor of largely Muslim Moro province from 1909 to 1913. At the time, the Philippines was a US colony and Pershing’s forces had to fight Muslim counterinsurgencies. The debunked account – which Trump has referred to in the past – is as follows: Pershing’s forces rounded up 50 Muslim insurgents and executed 49 of them with bullets dipped in pig’s blood – considered by Muslims to be unholy. Four historians previously told Politifact this version of events didn’t happen. In a statement, the office of German Chancellor Angela Merkel said the country was thinking of the victims of the “revolting attack” with “profound sadness”. Russian President Vladimir Putin called for the world to unite in an “uncompromising battle against the forces of terror”. “We decisively condemn this cruel and cynical crime against civilians,” Putin wrote in a letter of condolences to Spanish King Felipe VI. A spokesperson said United Nations Secretary General Antonio Guterres “condemns today’s terrorist attack on Barcelona” and “hopes that those responsible for this heinous violence will be swiftly brought to justice”. French President Emmanuel Macron voiced “France’s solidarity” with Spanish citizens after the “tragic attack”. My thoughts are with the victims of today’s terrible attack in Barcelona … and the emergency services responding to this ongoing incident. The UK stands with Spain against terror. It was a “cowardly attack against innocent people”, Dutch Prime Minister Mark Rutte said in a statement on his Facebook page, calling it a “black day at a place where many people around the world gathered”. Turkey’s Foreign Minister Mevlut Cavusoglu said the country strongly condemns the “heinous terrorist attack”. Footballer Cristiano Ronaldo, a star with Spanish premier club Real Madrid, said he was “dismayed” by the attack and voiced “support and solidarity with the families and friends of the victims”. Email “'They are assassins, criminals who won't terrorise us': Leaders react to Barcelona attack”. Feedback on “'They are assassins, criminals who won't terrorise us': Leaders react to Barcelona attack”.